The most popular souvenir in whole word is magnets. Each visitor center, each information center, each gift shop has a lot of them: plastic, rubber, metal, wood and "made in China":-). Flags, animals, beautiful views, anything you can imagine. I am collecting the magnets and always bringing a couple from all my trips (like thousands of peoples). I buying magnets as a small gifts for a friends and for my collection (sometime I'll show you my fridge). I was really happy to find an etsy shop with uncommon and "make me smile" magnets. Moreover they are handmade and unique. Donna and John create magnets that make you and your fridge laugh, or add some happiness to your office. I have really boring grey file cabinets at my work place so these magnets can add some color to it. This nice dog has name Autumn and Autumn likes fall colors. 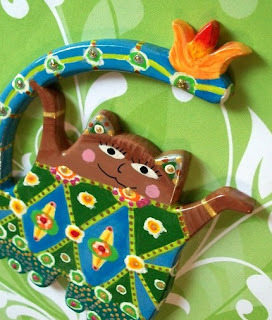 She is made from birch plywood and painted with acrylics, have artist signature, number and date on back. The John's vision of of the Shire where Bilbo's home sets in the side of a hill is depicted on the following magnet. 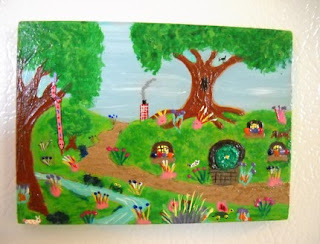 John is a big fan of Tolkien's "The Hobbit" and created this great gift for Tolkien fans. 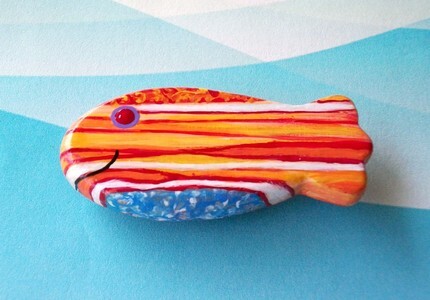 Last one I want to show you is colortul fish. This fish is handpainted and handcutted by John. If you need to remember something important just let this fish hold the note and you will never forget. You can buy all magnets shown in this post and a lot of others in this LaughingFridge shop. There is magnets for everybody and for each fridge. Enjoy! Your blog made me smile! Thanks so much for this delightful feature. You should see our fridge too, we collect magnets from everywhere as well as make them, lol. Love love love these magnets. You could set up a little aquarium with the fishy. I just LOVE LOVE LOVE these magnets too. I have fishies on my fridge. My mum has fishies too. My daughter has an alligator hanging in her room. I have a fishy near my craft table. Yay! LaughingFridge. And thanks Uienifer for the great post. All of their work is amazing. I am trying to steer clear of anything that isn't handmade, so these are perfect for this lifestyle! I love all of these magnets -especially the doxie! These are so colorful and fun! Nice feature! Love your post. I too adore magnets and handmade things. And you are right about the souvenirs- I have at least 30 on my fridge and it's the only collection I allow myself to have as I can get seriously carried away with something! Thanks for sharing. Love the bio on the artists too. Did you know they do custom items too? 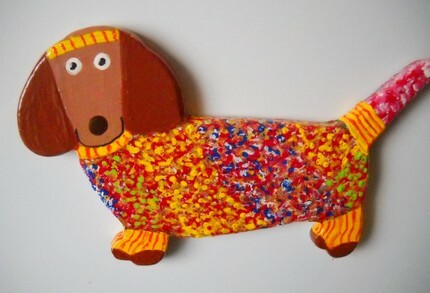 I ordered a doxie magnet for my mom for Christmas. Cant wait to see it! Laura, yes they are creating custom magnets too. It will be great gift! Lovely article! And love Laughing Fridges magnets! Laughing Fridge is such an awesome name for your shop. Talk about truth in advertising! Vintage Hand-painted Shabby Chic Stand "Spring"